Buoyed by Prime Minister Narendra Modi serving its three billionth meal, Akshaya Patra has now set its eyes on the "five billionth milestone" which it plans to reach by 2021 while expanding its footprint in a big way in Uttar Pradesh. The Bengaluru-based NGO said, besides, the foundation also wants to serve schoolchildren in Delhi, Bihar and West Bengal where it is yet to enter since its inception in 2000. 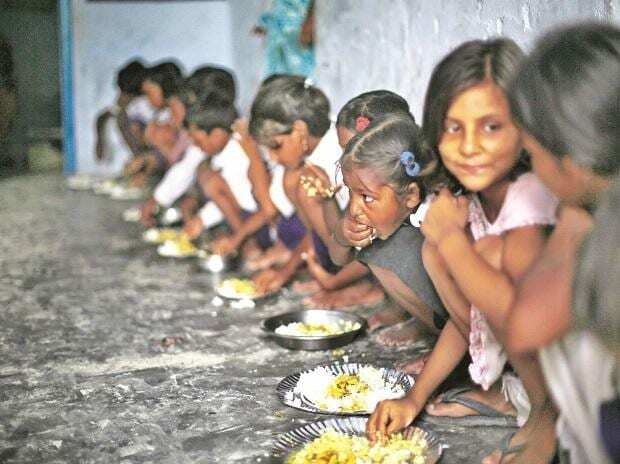 Akshaya Patra is the world's largest (not-for-profit run) mid-day meal programme serving wholesome food every school day to over 1.76 million children from 14,702 schools across 12 states and 42 locations, the foundation's chairman Madhu Pandit Dasa said. "We are honoured that our three billionth meal was served by the prime minister himself, to a group of underprivileged children in Vrindavan. We are committed to serve this cause, and now we have set a target for the five billionth meal by 2021," Dasa told PTI. At a mega event in the holy city recently to commemorate the three billionth meal, Modi had praised the efforts of the NGO towards eradicating hunger from the country and termed its milestone "a remarkable feat". "From serving just 1,500 children in the beginning to over 17 lakh now, we are committed to contribute to the growth of the country. And we are expanding our footprint across India, trying to enter places hitherto untouched," Dasa said. Twenty two kitchens are under construction and Akshaya Patra also wants to enter Delhi, where two kitchens have already been built, he said. "Delhi, we have been trying to enter for the last 10 years. We already have made two kitchens there and awaiting the nod from authorities. The Kejriwal government wants us to be there, but there are a few complications," the NGO's chairman said. "We also want to enter Madhya Pradesh and Bihar. And in Uttar Pradesh, we are expanding in a big way. The UP government has been helping us in building kitchens and funds have been released," he said. Bharatarshabha Dasa, director, Strategic Relations, Akshaya Patra Foundation, said, in Uttar Pradesh, a few cities have been identified for kitchens, namely Agra, Kanpur, Varanasi, Ambedkar Nagar and Ghaziabad, and six others are in the pipeline. The NGO's chairman during his address at the event in Vrindavan commemorating the three billionth meal had appealed to Modi to expand the mid-day meal scheme till class 12. "The scheme, under Sarva Shiksha Abhiyan, covers only children till class 8. I appealed to extend it to include classes 9-12 as well. In many, schools we found that students from upper classes watched as food was being served," he said. Dasa said Akshya Patra recently did a survey and found that "30-40 per cent" children were coming to schools without having breakfast, which hampers their growth and interest in studies. "If the government allows us, we can start serving breakfast too, and one million children we can feed under that, in one year," he said. Modi, in his address at the event held in the campus of Vrindavan Chadrodaya Mandir, had said, "Donation given to deserving people without thinking is 'satvik daan' (pure charity), Akshaya Patra is doing 'satvik daan'." "First thali through this NGO was served by former prime minister Atal Bihari Vajpayee and I feel fortunate to serve the three billionth thali today," Modi had said, before serving the meal to underprivileged schoolchildren, cooked at its centralised, state-of-the-art kitchen in Vrindavan. Dasa said Modi had opened Akshaya Patra's "first kitchen" in Gujarat in 2004 as the then chief minister of the state.